A board form concrete hearth that shows the details of the boards that were used in the forming process. Contemporary fireplace surround concrete block style. 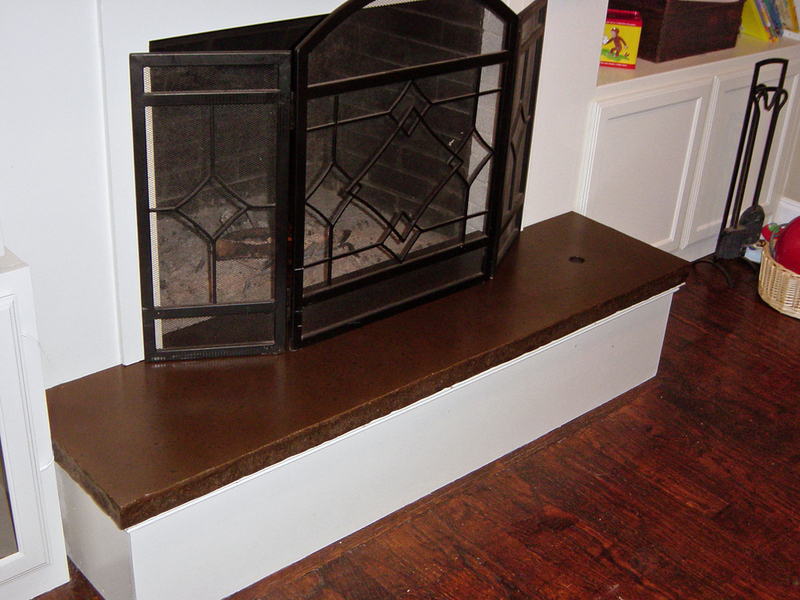 A simple, yet very effective, way to make your fireplace stand out. One of the more effective ways to enhance a room without major destruction is to use the existing structure as a support and use a polymer based overlay for a new decorative finish. Another former brick hearth that was wrapped in wood and set with a new concrete hearth. A basic block configuration surround with a integral brown color and black color rubbed in for toning. A different take on the block configuration with a shortened width of hearth. Gives a distinctive look. Concrete isn't the only option, hot rolled steel panels with a lacquer finish. We are only limited by your imagination or you can pick our brains and well be happy to offer up some suggestions based on your floor plan.